Like the best idiosyncratic songwriters, Mark Oliver Everett has spent his career flying under the radar with occasional blips of mainstream interest. It's a career arc that places him in the company of cult artists like Warren Zevon, Jonathan Richman and Robyn Hitchcock, even if his sonic template positions him more as self-aware sad-sack version of Beck — this is the man who wrote the line "I write the B-sides that make a small portion of the world cry," after all. Not that such comparisons would trouble the man called E; the singer, songwriter and multi-instrumentalist has kept razor-sharp focus, eschewing trends throughout his 17-year tenure fronting Eels. The faithful gobble up earnest elegies to a sister who committed to suicide and concept records about his beard alike. His most recent Toronto appearance came hot on the heels of Eels 10th studio album, Wonderful, Glorious, a record whose closest sonic link in the Eels oeuvre is 2009's Hombre Lobo. Consequently E and his four-piece band, decked out in matching black Adidas tracksuits, sneakers and shades, offered up a bevy of tracks from both albums. They favoured bluesy rockers — no acoustic guitars or keyboards this time out — and cherry picked from the band's deep back catalogue. Band members took the stage one at a time, easing into the Tom Waits-esque "Bombs Away." They worked through tracks like "Kinda Fuzzy," "Tremendous Dynamite" and their rousing cover of Fleetwood Mac's "Oh Well," before settling in for more relaxed numbers like "In My Dreams" and "Dirty Girl." "We're going to take you back to the 1900s," E said while introducing Electro-Shock Blues' "Climbing to the Moon." "An awful time. You would have hated it. I barely got through it." If you've never seen the band before, you might be surprised to find that Everett isn't the quite introvert he often presents on record; in fact, the signer was downright fired up, stalking his riser and yelling out to his band like an indie rock James Brown. "They Love it! Success!" he quipped following their initial salvo of material, during which he hugged guitarists the Chet and P-Boo and bass player Honest Al between songs. Al, an ordained minister, even renewed E and the Chet's vows onstage to celebrate their 10 years of playing together, with drummer Knuckles singing "Wind Beneath My Wings" for the occasion. 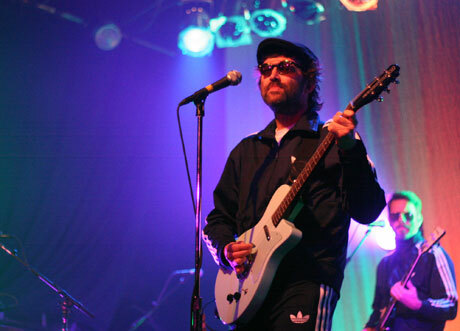 Despite playing a host of new material and older, more obscure nuggets not necessarily familiar to the audience, Eels were on point, bringing to life tracks like "Peach Blossoms" and the Small Faces' "Itchycoo Park" before ending their set with "Wonderful, Glorious." The band returned for Wonderful, Glorious bonus cut "I'm Your Brave Little Soldier." Then, noting that his record company had informed him that mash-ups were the new thing, the group played a great Frankenstein combination of "My Beloved Monster" and "Mr. E's Beautiful Blues." They once again left the stage before a blood-curdling take on "Fresh Blood." With so much material, Eels are bound to leave out favourites — their earlier material in particular was mostly absent this night — but the mixture of songs certainly kept the audience, who ate up each track, on their toes. And Everett never let the performance feel self-indulgent, bringing the crowd along for Eels wild, weird ride.